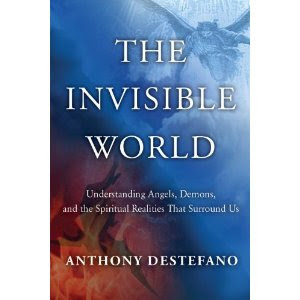 In writing “The Invisible World- Understanding Angels, Demons, and the Spiritual Realities that Surround Us,” Anthony Destefano sought to “try to make the invisible realities that surround us just a little more visible.” To do so, he stays away from the anecdotes so common in most books about angels, demons, and the life after this one. Instead, he relies on “solid theology, informed by common sense and logic, and backed up by Biblical scholarship and the universal teaching of the Christian Church over the past two thousand years.” This is what makes this work such a valuable resource. The importance of pain and suffering and the incredible power of grace in our lives are also discussed in depth. Heaven and hell, personal and final judgment are also discussed. Destefano is Catholic, but aims his books at a wider Christian audience. In his own words, “I try to take the CS Lewis approach, and write books which focus on those beliefs all Christians have in common.” Therefore, he does speak about the importance of God’s forgiveness but does not discuss the Sacrament of Reconciliation. In the same vein, his discussion of heaven and hell includes no mention of Purgatory. He does, however, encourage the very Catholic practice of “offering pain up” in order to help others. He largely aims his books at those who are not currently practicing their Christian faith in the hopes of encouraging them to return. This being noted, “The Invisible World” is also of great value to committed Christians and Catholics. It will help you set priorities in your life and focus on eternal , rather than solely temporal realities. It will help you understand the importance of the decisions you make, and hopefully make better decisions as a result. This entry was posted on Monday, April 11th, 2011 at 6:43 pm	and is filed under Book Reviews. You can follow any responses to this entry through the RSS 2.0 feed. You can leave a response, or trackback from your own site.